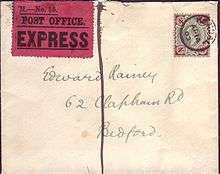 1903 4d Express mail cover from Kendall-Bedford with red official Royal Mail express label affixed. The vertical line also indicates that express service is required. Express mail is an accelerated mail delivery service for which the customer pays a surcharge and receives faster delivery. Express mail is a service for domestic and international mail and is in most countries governed by a country's own postal administration. Since 1998, the international accelerated delivery services are governed by the EMS Cooperative. Express Mail Service (EMS) is an international express postal service offered by postal-administration members of the Universal Postal Union (UPU). These administrators created the EMS Cooperative in 1998 within the framework of the UPU to promote the harmonization and development of postal services worldwide. As of January 2015, EMS was offered by more than 190 countries and territories worldwide. An independent auditor measures the express delivery performance of all international EMS operators. EMS Performance Awards are based on postal operator's performance, including service performance and tracking. Gold, Silver, or Bronze certificate are awarded to EMS Cooperative members depending on their yearly performance. These EMS award winners are recorded in the EMS Cooperative's Hall of Fame. Since its creation, 177 postal administrations have joined the EMS Cooperative, representing over 85% of EMS operators worldwide. Many transportation logistics firms offer similar accelerated services. UPS, DHL and FedEx are the most popular alternatives. However, in many countries such alternative carriers shipments have different status for several legal purposes. E.g. in Russia shipments from abroad to individuals for private needs are exempt from customs duties if value is less than €1000 and sent via post or EMS, while when sent by other means the exemption applies to values below €250 only. In some countries legal notification sent by post and EMS are deemed made on the date of dispatch, while for other couriers on the date of delivery only. ↑ "Civil Code of the Russian Federation". Wikimedia Commons has media related to Express mail.